This book is a fascinating investigation into how communalism plays out in everyday India. Using the metaphor of tana–bana —the warp and the weft of the Banarasi sari— the author reproduces the interwoven life of Hindu–Muslim relations in the Banarasi sari industry. 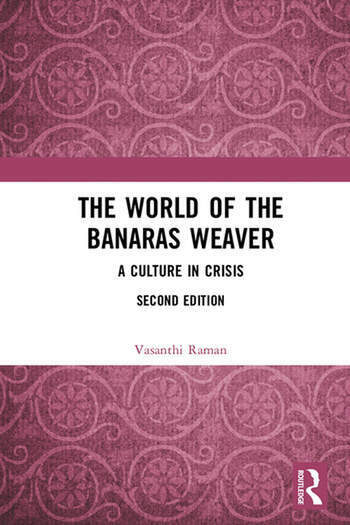 • Sheds light on their fast-changing world of the Banaras weavers and their responses to it. With a new Introduction and fresh data, the second edition looks at the subsequent developments in the weaving industry over the last decade. This volume will be of immense interest to scholars and researchers of social anthropology, gender studies, development studies, sociology and South Asian studies. Vasanthi Raman is Professorial Fellow at the Centre for Women’s Development Studies (CWDS), New Delhi, and member of the Indian Council of Social Science Research (ICSSR), New Delhi, India. She has also been Visiting Professor at the University of Joensuu, Finland, and Fellow at the Indian Institute of Advanced Study, Shimla, India. She has published extensively in books and journals on issues of social transformation — problems of marginalised groups, tea-garden workers and semi-tribal groups in northeast India; childhood studies and women’s studies. Her recent research work has been on communalism and the construction of gender and Hindu–Muslim relations.